The Danish nature agency, Naturstyrelsen, has announced it has finished planting over 1.5 million trees in the wake of the devastation sustained by Danish nature when the nation was hit by the two hurricane-strength storms Allan and Bodil in 2013. In south Jutland alone, one of the areas hardest hit by the storms, some 1.5 million trees have been planted. In fact, there’s actually a silver lining now growing out of the destruction. “The storms have helped accelerate our transformation of the singular coniferous orchards to more varied forests,” said Inge Gillesberg, a forester with Naturstyrelsen. 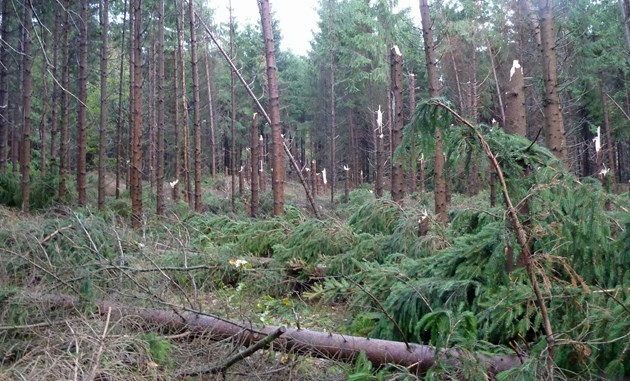 In south Jutland alone, the two storms blew over almost 200,000 cubic metres of trees – close to a third of the 680,000 cubic metres (2 million trees) that fell nationally. Some 95 percent of the trees that blew over were pine trees, while a large portion of the deciduous trees and pine trees that fell were left to rot on the forest beds to the benefit of insects, fungi and birds. The rest was sold to saw mills. “The destruction left in the wake of Allan and Bodil ranks third among storms that have hit state forests over the past 100 years,” said Gillesberg. The most destructive storm registered in Denmark took place in 1999, in which a million cubic metres of trees were brought down, while second place goes to the storm of 1981, which sent 950,000 cubic metres tumbling.